There’s a magic to old things dug out of the earth, having been lost for centuries. The volunteers who spend their holidays up at Vindolanda fort on Hadrian’s Wall must all hope that they will be the one to discover something new and precious. My version is in a bronze alloy and I have added an “ethnic cut” cabochon garnet to the “mirror” on the chain. This means the stone is slightly wonky, not calibrated, and so is closer to the garnets one can see in Roman, Celtic and Saxon jewellery. The maker of the Roman original would have started out with a thicker piece of metal and then, possibly, hammered the end flatter before cutting out the hand. As I started with a piece of 2mm Victorian door plate, I opted instead to anneal, twist and hammer the pin to give it strength. It will also have the benefit of catching in the hair better. 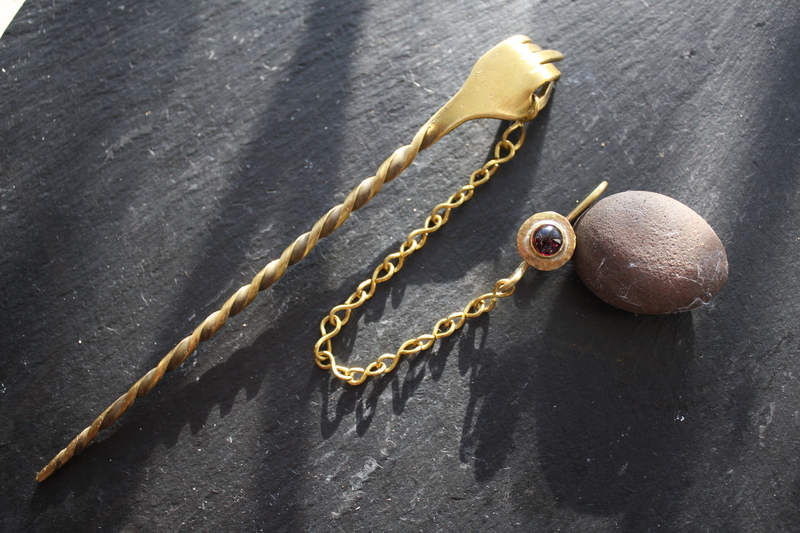 A Google search for “Roman hand hair pins” shows this was a very popular design so my version is decent recreation of a Roman hair pin without infringing any nasty copyrights. I do hope she wears it!